I’ve been meaning to come back to the topic of my book on Everyday Post-Socialist life in the small Russian town for a while. Having just done an interview for Sean’s Russia Blog gives me a good opportunity to do that. The blog homepage is here. I was very busy with other things at the time of the interview so I don’t think I did a very good job of describing the breadth and depth of the stories in the book. So I’ll have another go here in brief. Here are the questions Sean asked me, pretty much as they appear on the transcript. They’re in italics. My more considered answers follow and include some reflection on what I actually said in the blog interview. Your book is about everyday life in small industrial town of Izluchino. Where is this town and what is it’s postsocialist dowry? Why is everyday life important to study in a place like Izluchino? The town is just one example of the small industrial, working-class communities that exist today in Russia. It isn’t necessarily representative, because it is in Kaluga region. Kaluga has all kinds of relative advantages as a region which feed into local economic opportunities. On the other hand, it faces the same issues as most other places – rust belt deindustrialization, the still keenly felt withdrawal of enterprise support for local infrastructure and so on. The dowry is a term I borrow from Kaika and Swyngedouw (2000) via Elena Trubina who speaks of the ‘worthless dowry’ of Soviet industrial modernity (Trubina 2013). The urban dowry is the imposing elements of (often Soviet-) build environment that accompany technological networks. These are both the source of risk (accidents, pollution, unemployment) and the life-blood of industrial communities, even now. I critique the idea of industrial Russia as ‘worthless dowry’ as it reminds me of ‘modernization’ theories more generally, through which space, and ultimately people are reconstructed in a hierarchy of value. Workers in small towns at the bottom. But it is at the bottom that so many people live and call home. They don’t think about it in terms of ‘risk’ and danger. So a lot of the project is about giving voice to the normalization of the small town experience. Making it ‘anytown’. Reading the book, it’s clear that you developed close relations with your respondents. Who are these people? How did you meet them and how did your relations with them shape how you approached your understanding of postsocialist daily life? What was surprising to me was that if you show you’re prepared to listen, people will take that as goodwill and talk to you. And I tried in the book to be faithful to my ‘informants’ or research participants. I met some of them through my summer connection to a small village nearby. But most of them I built relationships with long term by being in the town and sharing in their lives. This also shaped my approach – to try to bring out as much of what was normal and everyday – as what was ‘bad’ or difficult. So there’s a lot in the book about relations of support, reciprocity, the informal economy and ‘getting ahead’, as much as ‘getting by’. Although simplistic ideas about ‘social mobility’ and entrepreneurialism are dealt with critically. You write that your book is “not a description of deindustrialization or factory life, nor is it a story of dispossession, pauperization and trauma after the end of the Soviet Union.” Rather it’s about how people make their life habitable. Talk about the concept of habitability and its centrality to your understanding of daily life in Izluchino. Having said that there’s a lot in the book about the ‘normal’ experience of everyday life, there’s also a lot of traumatic feeling expressed by young and especially older people – often in terms of the loss of a ‘social contract’ and social wages from the factory town. This was vividly expressed to me when I was interviewing a man in his 50s who had worked in the town his whole life and who felt, even now, completely betrayed by the processes of post-communist transition. His and other stories were supported by changes in the built environment I personally witnessed, such as the decorative Soviet canteen signs being taken down to be sold as scrap and the local authority’s inability to fund the repair of the local Soviet-era theatre and formerly well-equipped secondary school. So ‘habitability’ emerged as one way of talking about both ‘normalisation’ of life, and about the ongoing sense of loss – people’s awareness of losing out, but their commitment to making the best of the present in the local here and now. In another context I wrote about people’s local patriotism in terms of ‘malaia rodina’ – little motherland. This was a term people used in the town too. The issue of time has a presence in the book and how people situation themselves in it and understand their lives through it. How does how Izluchino’s residents understand the past and present, their feeling of being “out of time,” and “inbetween” function? This question was very much answered in terms of the sense of loss described in the previous section. What was surprising was that it also applied to younger people – some of the now in their thirties and forties and who were only kids or not even born in the USSR. This is still making me think a bit differently about the meaning of the word ‘nostalgia’. Your study is about personhood and working class identity. What does working class mean and how has life in post-Soviet Izluchino changed it? This is really tricky and I don’t think I can do justice to it in a blog post. Personhood is a just a way of drawing attention to the socially-shared and experienced aspects of ‘identity’. I used it to avoid too much the language of the ‘self’, which is so associated with a middle-class, bourgeois sense of identity – acquisitive, individualistic, and interpreted in similarly negative ways by working-class people all over the world. Here Bev Skeggs’ work was really instructive. What about the gender dimensions of this working class identity? How has it shaped postsocialist masculinity and femininity, men and women? One thing I am really happy about is how many women’s stories there are in the book. In fact you could say they dominate in the end, or at least resonate most. There is a lot from the perspective of the ‘old guard’ of women who quite often were the real ‘builders of communism’ in this town: the librarian, the forewoman of the main factory. They are left holding on to the remnants and trying to make it work – an impossible situation. Of course at the same time they are expected to hold the family together too. The classic ‘double-burden’ that many scholars of Soviet gender talk about. Then there are the younger women. There’s a chapter about three women in their early twenties making different choices – social mobility through migration, education, local compromise, and also the informal economy. One thing I would have liked to say more about is the mass of working women ‘at the bottom’ in shop work. There were only two times I had arguments with people concerning the material I collected for the book: a Russian colleague and a Western businessman both expressed disbelief when I told them how little women in shops were paid. What role does the informal economy play in Izluchino? This is a topic I’ve really done to death elsewhere. But, as in the interview, I’d stress how ‘black work’, or ‘cash-in-hand’ day laboring and gypsy cab driving is both a trap and an ‘opportunity’, and experienced as such by people. It’s both freedom from a ‘day job’ in the factory, and also drudgery of another, even more exploitative, and self-exploitative kind. But still some (men) prefer the ‘freedom’ of the unregistered taxi work, than the factory (whether old-school Soviet type, or new, shiny Western type). What does that tell us about blue-collar work now in the 21st century? Talk about the generational experience of Izluchino’s residents. How do the experiences of elderly and younger people intersect and diverge? This I think is answered already. The collapse of the Soviet system necessitated the transformation of the self to suit a capitalist economy and society. How do working class people of Izluchino address the challenge of becoming “flexible subjects” in an increasingly neoliberal atmosphere? This is also partly covered by the ‘person’, v. ‘self’ discussion. Also in the bit on the informal economy. Some people buckle up and dive into the remaking of the self – though consumption and production (and retraining to work in new jobs and industries). They squeeze the sovok small town out of themselves, sometimes literally (the story about the merchandiser woman who tries to reinvent herself in Moscow). Others, like my favourite Nikita, do everything they can to avoid self-work, including living ‘underground’ in the informal economy, or staying in the terrible working conditions and pay of the local cement factory. Finally, most of our understanding of Russia life in general, and life under Putin specifically through the big city—Moscow especially. How does daily life in towns like Izluchino say about “Putinism”? For this answer I refer to the piece I did for Current History: Putinism has little to say to working-class people and I resist the idea that they are somehow more vulnerable to populist rhetoric (although I’ve written about why they vote for the LDPR). What’s really depressing is how much punishment and lowering of living standards all Russians can put up with. One can’t help but look at Russian politics through the age-old prism of elites’ disregard for human life and human dignity. There is a cynicism at the top and a sense of disconnect from ordinary people that of course one finds everywhere in the world. Only in Russia it is pretty coarse. I’m just a bloke…. Those who know how to work know many other things besides and so won’t lose out. They can do things with their own hands. They get a satisfaction from it – that they did it themselves. I suppose it’s a kind of inner happiness [dushevnyi pod’em]. You’ve just got to try to do it! Don’t be afraid, someone will see and try to help you if you are prepared to help yourself. […] This is where I’m comfortable, my habitat [sreda obitaniia], and I this is where I will stay. This entry was posted in Uncategorized on 31/01/2017 by Jeremy Morris. It’s been a long while since I wrote for this blog – partly because I moved institution over the summer at quite short notice. My book also finally came out. I’ve hardly had time to open the hard copy sent to me by the publishers. I’d like to do a lot more micro blog entries about the contents, but for the time being I’ll recap on some of the other stuff I’ve managed to do between moving across the North Sea and adapting my teaching for the rather strict requirements of the Danish Higher Ed system. a piece aimed at general readers that might delve into themes you’ve focused on, such as the informal economy, working-class life in monotowns, and the effect of Western sanctions on Russian workers. Ideally it would also provide a brief sketch of the history of Russian labor relations and particularly the transformations seen since the end of the Soviet Union. Arrgh – how to give that coherence in what is a short piece in comparison to full-length articles of 20 pages? Description: “Workers form the exemplary class of economic, social, and psychological ‘losers’ of the postcommunist transition.” Second in a series on labor relations around the world. As you can see from the mini-abstract – I went with a kind of popular class analysis – working-classes of emblematic of the social and economic costs of postcommunism, but also the loss of status and sense of psychological security that many people felt in the socialist period. This isn’t original – David Kideckel in particular does a really good job of bringing out the ‘losers’ argument in relation to Romanian miners in his work. Of course, on the resilience front there’s been lots written from different angles – from Sarah Ashwin on ‘patience’ and endurance of Russian workers, to this recent Reuters piece. What was instructive for me in writing this piece based on the material for my book was how to write to a set of subheadings in a short piece. This is something I’ve recently encountered elsewhere – writing for the BBC (for an internal report). Just today, when struggling with a mass of data (28 focus groups), it was actually really helpful to be told by the subeditor: “the subtitle should tell your readers what you want to say!! !” Yes, we academics really are that buried in the detail that we can’t see the wood for the trees. [Preamble]: workers don’t look to the state to help them, even though the state has tried to co-opt them politically with things like the All-Russia People’s Front. Workers have formidable potential structural bargaining power but are relatively poorly organised. The overall institutional wasteland that is the Russian state means that it lacks effective feedback mechanisms to understand how badly Russian workers have fared in the last 7 years. Slow Bleeding is a 600-word section on the erosion of employment and pay over the last 25 years for blue-collar work. I talk about this a lot in the book. Also I talk about the effect of ruble devaluation on real incomes. People even in Russia don’t believe me when I tell them how much people live on. Sheesh! Lost Guarantees is a shorter summary of how the loss of social benefits is still really keenly felt. Monotown islands talks about the geographical isolation of industrial towns in Russia (the metaphor borrowed from Finn Sivert Nielsen). Again, I indicate the potential relevance here for politics as it is easy to ignore these places until the anger boils over, like with Pikalevo in 2011. Production Cultures talks about how working class identities remain important, and these are local AND classed identities at the same time. What I like about this section is how I contextualise Russian labour migrations in the middle of the twentieth century as a still living part of a late industrial revolution – with identities still important now. There are a couple of other sections, including on the significance of the informal economy and autonomy in work – two big topics in the book. I round up with a very pessimistic section on the unlikeness of significant working-class protest in Russia – why? Because of the infinite capacity of Russians – not just workers – to put up with being punished by their state. Who got the co-opt job? ‘I think that in this context, you, as someone who has spent your working life in industry and knows how ordinary people live, would be the right person for this job and will be able to defend people’s interests.’ – Putin to the former foreman of the tank factory on appointing him as the Kremlin envoy for Urals. Maybe my conclusion was rather too neat – and this was my major misgiving after writing my first real op-ed piece. This article compares industrial relations in production sites in Slovakia and Russia owned by a single transnational automotive firm, Volkswagen. We analyse the empirical data using a working-class power approach. In Slovakia, associational and institutional power is well developed and influenced by the model of German work councils, but structural power is weakly exercised and unions rely on non-conflictual engagement with management. In Russia, structural working-class power remains strong, but the opportunities for transforming this into lasting associational, let alone institutional power, remain limited; thus new unions make use of unconventional methods of protest to promote worker interests. This entry was posted in Uncategorized on 31/10/2016 by Jeremy Morris. The relevance of ‘post-colonialism’ to post-socialist contexts just keeps cropping up in the most diverse of places (Snochowska-Gonzalez’s recent piece, and my colleague Kevork Oskanian’s work), so while it’s not the main focus of any of my work at the moment, it’s definitely worth making some space to think aloud. A book I’d like to have written! – another thing that prompted me to write this post was rediscovering an essay I wrote in 1997 about the Zapatistas and Franz Fanon. What initially kicked off my interest in the applicability of the term ‘subaltern’ was its use by David Kideckel in his 2002 article: ‘The Unmaking of an East-Central European Working Class’ in Postsocialism. London: Routledge, pp.114-132. In the undergraduate class I teach on anthropological approaches to post-socialism, I ask students to read that article alongside this one: Stenning (2005) ‘Where is the Post-socialist Working Class? Working-Class Lives in the Spaces of (Post-)Socialism’, Sociology, 39(5), 983-999. Then I ask them the question: What do you understand by Kideckel’s use of the word ‘subalternity’? Compare it to Stenning’s discussion of passivity? In postcolonialism, subaltern is the social group who are socially, politically, and geographically outside of the power structure of the colony and of the colonial homeland. The term subaltern derived from Gramsci’s work on cultural hegemony, which identified the social groups who are excluded from a society’s established structures for political representation. It is a matter of debate whether he meant to use the word in place of ‘proletariat’. “Subaltern is not just a classy word for ‘oppressed’, for [the] Other, for somebody who’s not getting a piece of the pie. . . . In post-colonial terms, everything that has limited or no access to the cultural imperialism is subaltern—a space of difference. Now, who would say that’s just the oppressed? The working class is oppressed. It’s not subaltern. . . . Many people want to claim subalternity.” (Spivak, in de Kock, 1992). But how does Kideckel use the word? It really is fundamental to his argument that post-socialism sees the imposition of a form of neocapitalism. For him, transition theory underestimates the pace of change in the 1990s and after. Neocapitalism is a ‘social system that reworks basic capitalist principles in new, even more inegalitarian ways than the Western model from which it derives (2002: 115). He then gives a strong hint that he sees this as related to the argument that transition can be compared to neo-feudalism – which is confusing given that feudalism and capitalism are normally seen as distinct stages of accumulation. Actually he relates the present predicament of his Romanian workers to that of peasants in Braudel’s ‘long sixteenth century’ and neo-serfdom – whereby peasants were nominally free, but landless, and still tied to a wage-paying landowner (see Makkai 1975). In this sense, Kideckel aligns his position to that of World-systems theory (Wallerstein and Eric Wolf) and the latter’s call for giving voice to the ‘people without history’, but who are always present and part of processes of globalization. Accordingly, Romania is caught in a system of dispossession sees a Western ‘prototype’ reworked to establish a dependent semi-periphery in CEE. So what about the subaltern? Kideckel continues his analysis by using words like ‘durable inequality’, and ‘degraded supplicants’ to describe workers. The mines close and workers, already towards the bottom of a knowledge-based division of labour under socialism, are structurally relegated again. Kideckel notes that Rudolf Bahro (1977) used the term sub-alternity to describes workers under socialism. 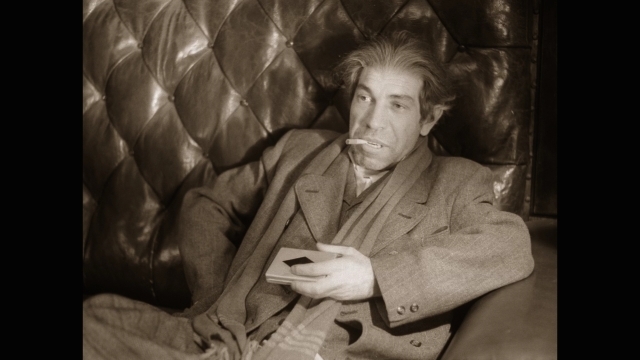 Bahro, who also coined the term ‘actually existing socialism’, argued that workers were cut off from involvement in the ‘plan’ and forced to do the psychologically and intellectually deadening work of routine production (Gabbert 1983). Subalternity is therefore the ‘condition of psychological and intellectual narrowness experienced by those whose work provides no opportunity for aesthetic and mental growth’ (ibid). This sounds a bit woolly to me. Kideckel is much more robust – in fact he provides an eight-point definition of subalternity under post-socialism which boils down to lack of information, knowledge, representation, class solidarity, symbolic capital, and the dissolution of social networks of support. This sounds a lot like the more recent concept of precarity to me. The 2008 Kideckel book doesn’t have an index entry on subaltern, but does have a chapter talking about the othering process of workers. The reason I ask students to compare Kideckel to Stenning is because of her use of the term ‘passivity’ and her concern with the need to foreground a ‘middle-position’ of agency between passivity and organised industrial action. That brings us nicely to Robert Brenner’s critique of the world-systems theory that Kideckel implicitly draws on, which he argues neglects local class structures and class struggles: ‘They fail to take into account either the way in which these class structures themselves emerge as the outcome of class struggles whose results are incomprehensible in terms merely of market forces.’ (Brenner 1982). Criticisms of Bahro revolve around the rise of worker self-organisation in Poland in the early 1980s as a refutation of his position. And all this relates to a potential criticism of the subaltern label as effectively denying any sense of agency. It is a long time since I read much on colonialism, but the term ‘subaltern’ brings associations of utter powerlessness to mind. In my book, I talk a bit about Bhabha’s work and make use of bell hook’s famous quote on the dangers of academics thinking they can ‘talk about you better than you can speak about yourself’ – the dangers of academic interpretation on behalf of the subaltern redoubling that positioning. However, I don’t want to rehearse those arguments here. The main point is that Stenning is right – there has to be a balance between inflexible structurated and naïve ‘resistance’ positionings of the post-socialist working-class. As so often in such circumstances, I look for help in Burawoy’s work on Hungary and Simon Clarke’s still under-rated work on Russia. Burawoy famously noted that workers developed a ‘negative’ class consciousness – they held communist governments responsible for not fulfilling their promises of worker’s ‘inheriting the earth’ (1992: 114). Clarke makes a very good job of explaining how the potential structural power of workers was (and remains) high, yet they remain atomized politically. He goes to great lengths to criticise the argument that the soviet system was a form of state capitalism. Instead he proposes it as a form like feudalism (What about the workers? 1992: 26). Here were are back again at a term that links to a kind of subaltern positioning, and the present. Just like in Burawoy’s context of late socialist Hungary, we now also have social and economic conditions not keeping pace with workers’ expectations, and a new urban middle-class growing and claiming ‘too much’ of the economic resources. Clarke says that in the late Soviet context workers were subordinated in a sense that was comparable to capitalist alienation. For Clarke, class struggle could not develop as it was displaced into factional struggles in the other structures of power. Kideckel (2002, 2008) stresses the ‘unmaking’ of a working class in Romania; the pace of ‘neocapitalist’ forces there leads to extreme declines in workers’ fortunes. By contrast, Stenning and Adrian Smith emphasise the domestication of neoliberalism by ordinary people – effectively their uneasy accommodation with it – using the informal economy and survival tactics taught by socialism to get by. Repoliticisation is not offered as an option – except perhaps recently by Don Kalb. But the ‘political’ response can take many forms, as any history of colonialism shows. If we accept two conceptions of subaltern – Spivak (silenced), and Gramsci (denied political representation) and then add Clarke’s ‘subordination’, as well as a good dose of alienation and the continuation of atomization, then surely subaltern works as well as any other term. The centre of Kaluga in 2009 – one of my informants took me to this spot to illustrate a point about ‘powerlessness’ in Putin’s Russia. But what about Burawoy’s ‘negative class consciousness’? – it implies, after all a political articulation of the worker’s objection to his or her positioning. Maybe ideas like ‘proletarian refusal’ are ways of linking the post-socialist workers’ tactics with those of the traditional subaltern of colonialism. Indian swadeshi stressed self-sufficiency and the ‘refusal’ of the colonisers’ goods and economic settlement (Manchester cloth). Michael Hardt and Antonio Negri in Empire use the term ‘proletarian refusal’ in name-checking Kelley’s black working-class history of the US. There are plenty of points of intersection between the tactics by the subjects of my research and Hardt/Negri’s ‘nomadism’, ‘refusal’ and ‘vogelfrei’ metaphors. (The latter – ‘free yet rightless’, derives from Marx’s own kind of Bhabha-esque interstitial conception of workers between feudalism and capital – seemingly used by Hardt/Negri as a metaphor more positive – making a virtue of precarious positioning). The tactics used by people in my research in relation to what they perceive as a ‘bad’ formal jobs include actual ‘refusal’ of formal work, engagement with informal or subsistence economies and work, self-provisioning, and other ‘tactics’. I suppose one of the real tests of the term subaltern, is the ability of groups of the dispossessed to turn tactics (boycotts of British cloth or sugar) into viable long-term strategies. A strategy, in turn means they are no longer ‘subaltern’. A ‘tactic’ of the powerless? graffito demanding ‘equality’ in central Kaluga, 2009. This entry was posted in Kideckel, subaltern, Uncategorized, working-class on 29/02/2016 by Jeremy Morris. This post is a bit at cross-purposes – I’m writing about class from so many angles now. Testament to the unorginality of the argument today is that the comparison is implicitly made to Bulgakov’s objection to the Russian Revolution. Then we have the issue of academe’s built-in middle-class perspective in any society – it reproduces bourgeois conceptions of politics, even as it makes a pretense to being ‘critical’. But in Russia and elsewhere in the East it is worse, as any study of working-classes is like academic kryptonite – associated with the ideological straitjacket of the socialist era when all academic work had to pay lip service to a painting-by-the-numbers Marxism-Leninism. A year ago I was asked to write a ‘review’ piece justifying the need for a new working-class studies in former communist societies. I agreed enthusiastically, but because of my book project I put the idea aside until a few weeks ago. I am not going to give details of the journal yet, as the piece should be out for blind peer review. Anyway, I finally got back into it but immediately there was a problem – how to summarise in 4000 words the rich patina or work going on not only in social sciences – particularly ethnographically, but in labour history and elsewhere? In the end I’m not really happy with the result which is bitty, and still rather disorganised. I still like the first bit though, where I argue that in Russia in particular, normative assumptions about class are everywhere, even as ‘working-classes’ are made invisible or rendered passive ‘bydlo’ (yes Latynina, I’m looking at you! ), prey to populism and the latest ‘ura-patriotism’ of Putin’s state machine. Second is this really nifty piece on Slovakia by Brian Fabo that arguably renders my own efforts rather superfluous: Rediscovering Inequality and Class Analysis in Post-1989 Slovakia. The original impetus for my piece, however, was reading Natalia Zubarevich’s ‘Four Russias‘ pieces and discussing them with my Political Economist colleague, the wonderful Richard Connolly. I then came across Anatoly Karlin‘s well-reasoned objections to Zubarevich’s position. While I don’t share his pro-Putin agenda, the highlighting of the elitism and barely disguised contempt of ordinary Russians by the intellectual opposition is spot on (more in the comments than the actual blog). Class is everywhere you look in the post-socialist world. The media are awash with stories about aspirational yet ‘normal’ ‘European’ lifestyles and the desirability of gated communities. There is the endless discussion of ‘communist-era’ mentalities and outmoded concepts such as social justice and cohesion. Popular culture is rife with trashy stereotypes of ‘low-lifes’ and track-suit-clad petty criminals that serve as thinly veiled fantasies about the dangerous lumpenization of the post-socialist working classes. Given the persistence of semi-authoritarian governments in the former Soviet Union and resurgent populist politics in Eastern Europe, social protests are analysed for what they reveal about the growth of the middle class. In scholarship too there is selective attention and selective invisibility. In Russia, one of the least democratic and largest of the post-socialist states, the liberal English-speaking intellectual elites bemoan what they see as the political compliance of ‘ordinary people’ to the government’s revanchist, chauvinistic and authoritarian agenda. Pensioners, rural dwellers, but even more so the blue-collar workers of the industrial ‘hinterlands’ are seen as a dangerous class of political conservatives, or worse, in Central East Europe they are seen as easy prey to populist neo-nationalist movements (Kalb 2011: 7). Easily written off in this way, the road to modernization and democratization is reserved for the ‘creative class’, a construction that belies the continuing widespread reality of low-tech manufacturing and resource extraction which underpins many of the regions’ economies. Indeed, many of these states have become sought-after sites of manufacturing because of the new consumer markets they offer to transnational corporations. It is strange that we write off the study of workers at the very moment they may serve as a revealing crunch point at the meeting of unbridled neoliberal capital and disembedded labour between global north and south. Just as once the working-class were the ‘vanguard’ of revolution and progress, now the ‘creative class’ are a talismanic ‘locomotive of modernisation’ and social transformation of these countries into ‘normal’ polities. ‘Middle class’ comes to stand for class studies more generally, but with little or no acknowledgment that in CEE this group still remains a ‘spirit seeking a social body.’ Similarly, when it comes to work and organizations, scholarship often focuses on the genuine success of the creative and new media industries, while the bread and butter of the socialist era – blue-collar work or the factory, is rarely the object of research, except as a form of ‘ruin-gazing’ (High 2013), or as part of the study of urban renewal and deindustrialization. This entry was posted in Uncategorized on 14/11/2015 by Jeremy Morris. 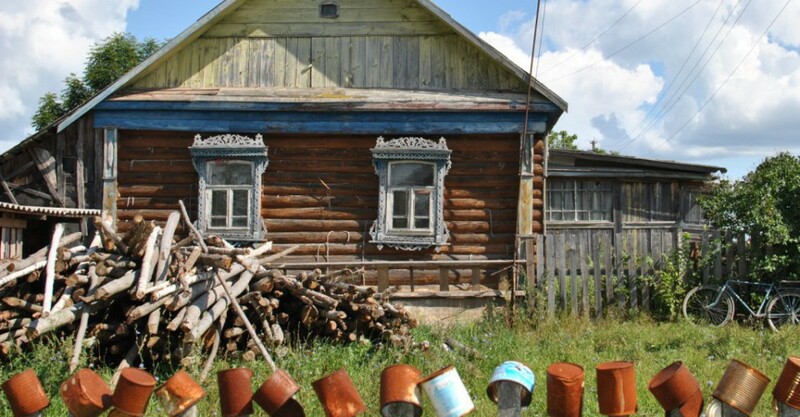 I start this blog towards the very end of the very research project it was supposed to support and disseminate – a book-length ethnographic treatment of everyday postsocialism: small town life in a Russian blue-collar community which I call ‘Izluchino’. The book is ‘safely’ (fingers crossed) in production now and I’ll be writing some more entries about it shortly. However, the process of negotiating with the publisher on the manuscript raised some interesting issues. So this is as good a time as any to start the blog. I always imagined publishing a monograph on my town full of images – how naïve! With my present publisher we agreed on six half-tones. But recently I realised that some of my images taken in 2009 were quite low quality – the publisher requires 300dpi. So in the end I asked some of the people in my research to go back and take photos of places in the research again. They went straight out and took the photos: a wonderful example of the sometimes overlooked positive stereotype of Russians and work: if you want something done in a hurry – ask a Russian. Russian storming of deadlines – avral – is also in the book! On the one hand this was a pity as the new photos of course didn’t really capture the moments of the research. On the other, they allowed me to see visible changes over the five years the research. The next few entries will discuss the photographic recording of research and some musings on the pictures that made it, and didn’t make it into the book. The first, and most important image, arguably, is the building where a key informant called Galina works. She’s one of the old guard – the aristocracy of labour that clings on in the town. They worked their way up to positions like foreman and brigade leader in the factories. There’s a whole chapter largely devoted to Galina, who is in her 60s now but still working. Here’s the photo of her factory in 2015 – I call it Polymer. They make pipes for the gas industry here. 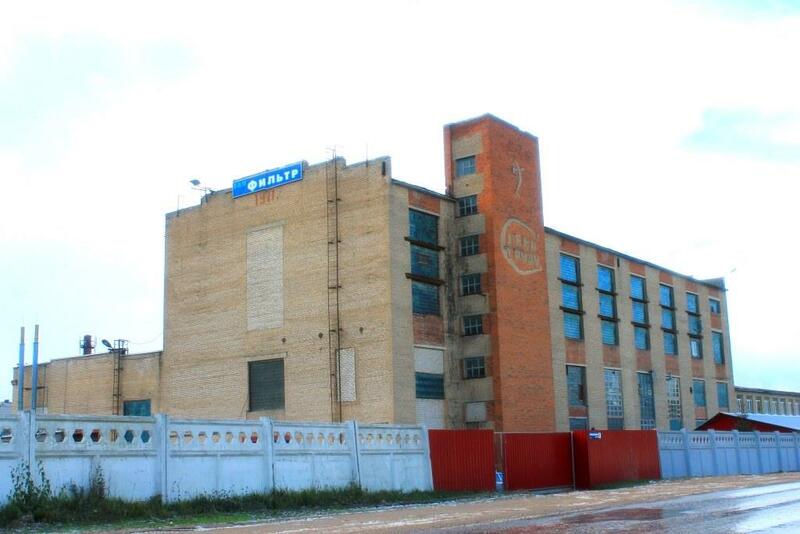 The factory has been in dire straits for over 15 years, but just hangs on. My friend Alyona Kudriavsteva took the photo of the factory last week (changes are some double-glazing added, not really visible in this shot, but the wall where the roofing tar had dripped down still hasn’t been cleaned in five years). By the way, ‘Filtr’ is not the firm where Galina works. Her shop shares the building. Why this photo – well obviously there is the conveying of the drabness, the enclosuring of space by the factory – it’s a stereotypically dour and functional Soviet building. higgledy-piggledy put up in 1971 (see the brick work even tells you this – the Soviet obsession with jubilees and facticity)- possibly using some prisoner labour. Then there’s the hammer and sickle ‘device’ – deviz in Russian, from the same Latin root for ‘desire’, means ‘slogan’. The ‘intention’ of the Soviet slogan is to express and embody ‘Glory to labour’. A very common slogan that I saw out of my flat window every day when I first lived in Russia in 1995. Why is that important? Well, despite the cynicism with which the communists treatment of the working class was understood to mean anything but ‘glory’ by actual workers, Galina is a great example of someone that continues to live that slogan. For her life is work, and dignity is accessible through work, regardless of circumstances, and regardless of one’s working environment. 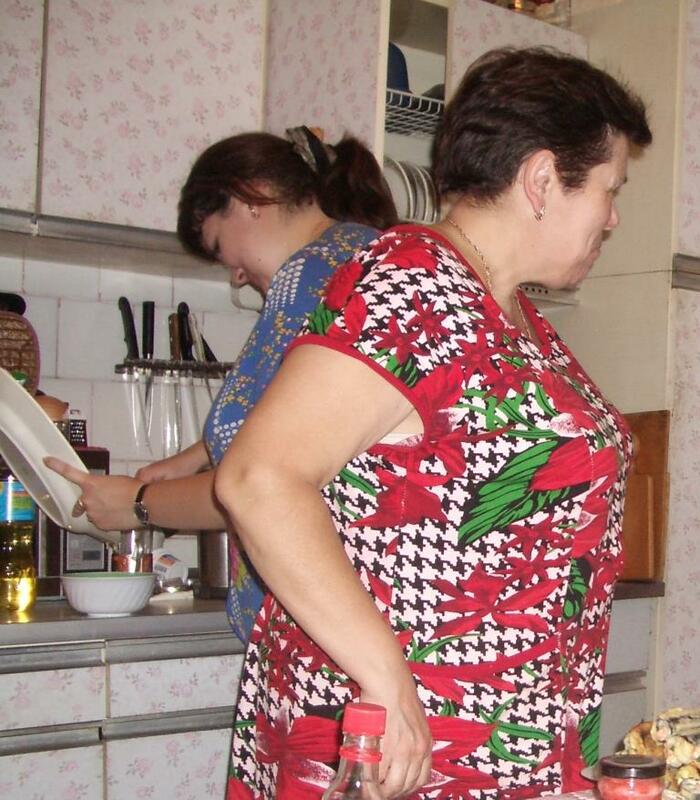 Here is Galina in 2009 with one of her daughters. In actual fact, the factory is a relatively nice working environment – the brick-glass windows provide plenty of natural light while keeping the cold out. Galina and others really looked after it – especially the trees in the yard and the cacti on the windowsills (I wrote an article recently that starts from the premise of cacti as connecting people to memories of the socialist period). It was very interesting when a trade union organiser at one of the purpose-built shiny new German car factories in Kaluga city complained that in terms of working environment these Soviet factories were far superior. But that’s another story. This entry was posted in Uncategorized on 19/10/2015 by Jeremy Morris. Welcome to the Postsocialism website and blog. This is a project bringing together all things related to my research on post-socialist societies – particularly Russia. I will also occasionally post about the nitty-gritty of doing research and trying to carve out an academic identity (and career) in terms of being categorised as ‘that bloke that does Russian stuff’. I published this site in Jan 2015, but only got around to posting on it in October. That already tells you something about the whole academic way of ‘doing’ things. This entry was posted in Uncategorized on 26/01/2015 by Jeremy Morris.